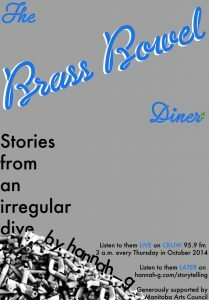 The Brass Bowel Diner: stories from an irregular dive. A sign writer who couldn’t spell, drugged milkshakes from cows who eat more than grass, and the kind of proprietress the hipster coffee shop down the road doesn’t want to cross… this serial is broadcast every Thursday in October at 3 am on CKUW 95.9 fm, but don’t worry you can listen later here. Thank you, Manitoba Arts Council/ Le conseil des arts du Manitoba for your support. And thanks to CKUW for being the best as always.